Not long ago computer screens used to be massive. But now we have much slimmer LCD, TFT and plasma screen available. See a funny correlation between sizes of screens and tummies! 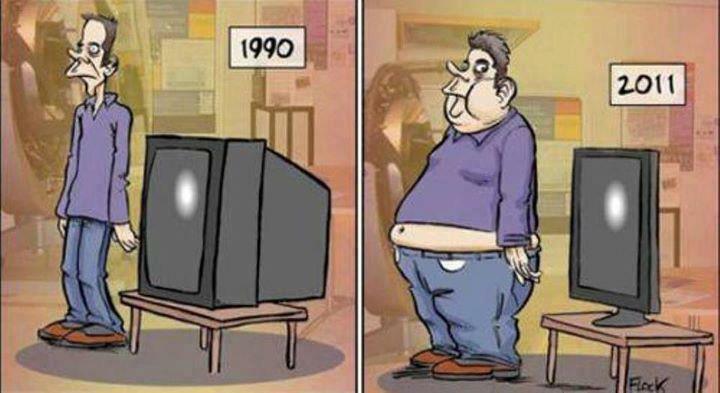 This cartoon, sourced from Internet, humorously depicts a rude reality of modern times. Not long ago, television sets and computer monitors used to be made of Cathod Ray Tube (CRT). These monitors would occupy quite a bit of space on our desks. But now, with technological advancements, much slimmer flat screen monitors sit on our computer and TV tables. A parallel truth, however, is that people are increasingly working on computers and therefore opting for a more sedentary lifestyle. A consequence, we, the humans, are getting fatter and sluggish. Earlier when our lifestyle was more physically active, in general, people used be leaner and fitter. It is very important that while working with computer, you also keep your body active. Taking regular breaks from work and walking around for a few minutes before returning back to work table is perhaps the simplest but very effective thing you can do to keep yourself going for longer time. Work/entertainment on computers could be addictive for some people. Beware of this addiction and be physically active as much as possible.